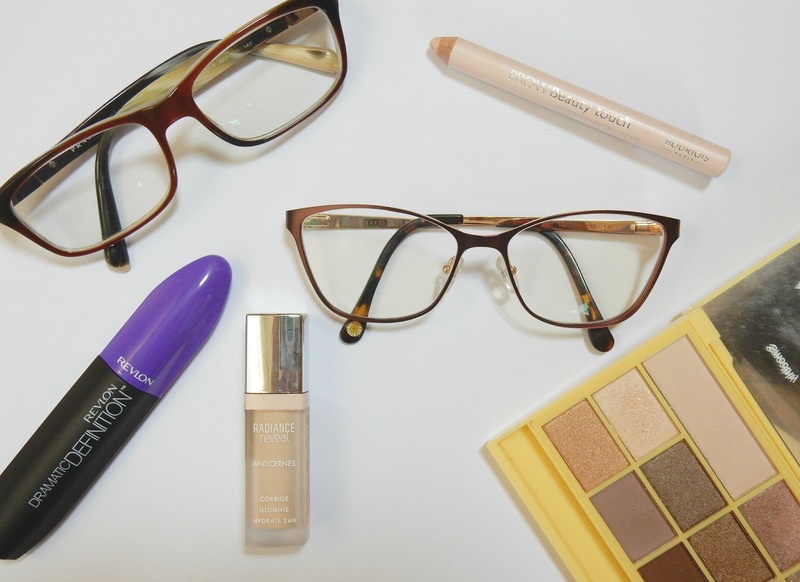 So first off, I feel I should say that by no means are these tips extensive, nor does anyone have to follow them, they're just some tips and tricks for my makeup that I've learnt over the years of wearing glasses. I first started wearing glasses at around the age of 12, just when I needed them for long distance things, and then at about 14 I started wearing glasses all the time. That was also around the time that I started wearing makeup more, and experimenting with makeup. So considering I've worn glasses everyday since then, I feel like I have a trick or two up my sleeve about getting my makeup to work with my glasses. My first tip isn't really to do with makeup, but find some frames that you like. There will often be people advising you on frames and whilst their advice can be helpful, it's important to make sure that you like the glasses that you're going to be wearing. I personally like to go for warm browny tones in my frames as that suits my hair and skin tone the best. I also like the lenses to be medium to large sized as not only does this mean I don't see the rims too much, but they open my eyes more too, which are quite small anyway without being put behind glasses. Secondly I'd say have groomed brows. Glasses can highlight your brows, and I find that keeping mine groomed and looking neat really does make all the difference. I went to a professional to get my brows waxed at about 15 so I could get a really nice yet natural shape. Luckily since then I've been able to keep up with the shape through just plucking them myself, although I do like to get them properly done and tinted occasionally when they need a proper sort out! I also like to fill my brows in on a daily basis; I used the Soap and Glory archery brow pencil in Hot Chocolate and then just set them in place with the L'Oreal brow artist plumper in Medium/Dark. My next tip is to brighten up your eye area. Morning and night I use the Superdrug Naturally Radiant brightening eye cream to not only smooth my eye area, but to help brighten it a bit before I'm even thinking about makeup. 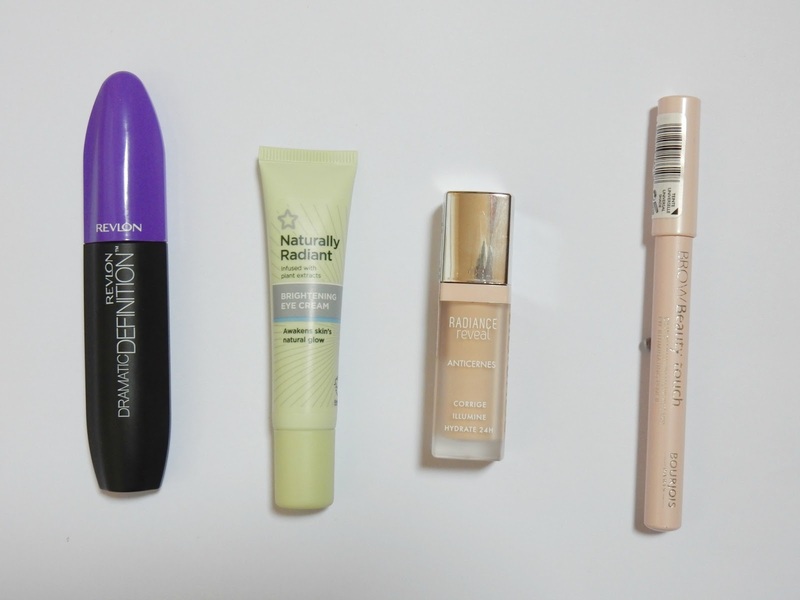 When it does come to makeup I'm currently loving the Bourjois Radiance Reveal concealer to really brighten up my eye area and conceal my eye bags. I apply it in quite a large triangle shape to make the most of the highlighting benefits, and to make sure that there is a light reflecting product around where the rim of the glasses are on my cheeks. This is help any shadows formed from my glasses on my face look less obvious. Making my eyes look bigger is vital for me, as otherwise they tend to get a bit lost behind glasses. I do this by using fairly neutral eyeshadows, and making sure that I stick to brighter shades all over the lid and in the inner corners and then a darker shade through the crease and slightly on the outer 'v' of the eye. Sometimes I'll then use a chocolate brown kohl pencil along my lashline before adding lashings of mascara for full lengthed lashes. I love the Max Factor False Lash Effect and the Revlon Dramatic Definition ones. As well as making sure that I highlight my inner corners, highlighting my brow bone is equally important, as is my lower lashline. I find that a white liner looks too harsh on me, and so I've been loving using the Bourjois Brow Beauty pencil. It's a beautiful pinky/pearly highlighting pencil that cancels out redness on my lower lashline and makes my eyes look much brighten and more open. So those are my tips for eye makeup when you wear glasses, do you have any of your own tips?